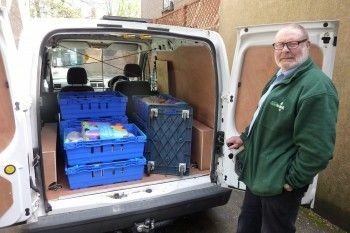 Barrow Foodbank’s new van will make it easier and more efficient for volunteers to collect and distribute essentials such as food and household items. 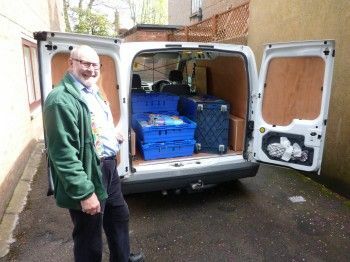 Thanks to a £500 grant from Cumbria Community Foundation’s Barrow Community Trust, the Foodbank was able to fit their new van with protective paneling and purchase a dolly to move crates around. Val Robinson, Foodbank Treasurer said: “The grant enabled us to engage with more local organisations and collect food from more collection points. In particular, the grant has very much supported the ‘Children School Meals’ project where the Foodbank delivers food boxes to schools for distribution to affected families during holiday periods when school meals are not available. “We are truly a community group with the community donating food which is given back to local people in food crisis. The Foodbank receives donations from the public and deliver to 8 permanent collection points across Barrow Ulverston and Millom. The Barrow Community Trust aims to support voluntary and community organisations within Barrow and Furness.